Smoke and Mirrors: Exposing REDD: The Agenda to Privatize Nature. 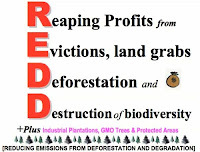 Exposing REDD: The Agenda to Privatize Nature. REDD+ claims to be a climate and deforestation solution, a pillar of the so-called "Green Economy." In reality REDD+ constitutes a worldwide land grab and giant carbon offset scam to profit northern industrialized nations. “ ….. nothing more than capitalism of nature; a perverse attempt by corporations, extractive industries and governments to cash in on Creation by privatizing, commodifying, and selling off the Sacred and all forms of life and the sky, including the air we breathe, the water we drink and all the genes, plants, traditional seeds, trees, animals, fish, biological and cultural diversity, ecosystems and traditional knowledge that make life on Earth possible and enjoyable. “ ….. Under the green economy, even the rain, the beauty of a waterfall or a honey bee’s pollen will be reduced to a barcode price tag and sold to the highest bidder. At the same time, the green economy promotes and greenwashes environmentally and socially devastating extractive industries like logging, mining and oil drilling as “sustainable development. 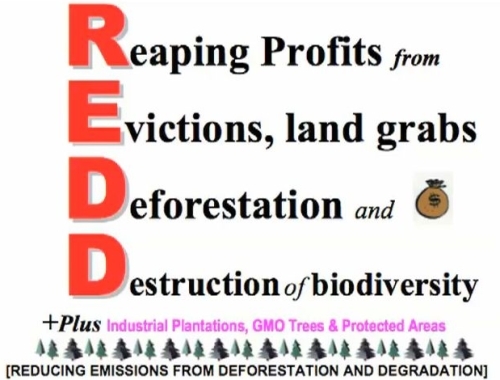 Watch the video below to get the real story of REDD, the deceptive climate ‘solution’ being proposed in California and being implemented within the UN climate negotiations and the World Bank. It sounds good on paper, but the reality is that REDD enforces the global colonization of Mother Earth; allows the polluting industry to expand its toxic emissions creating local toxic hotspots in faraway places; and creates a stolen future for Indigenous peoples, local forest dependent communities, communities living next door to a fossil fuel polluting industry, and a stolen future for the environment and all life.